NUMBER 3 FOR ME, KIRBY! Most of you know that my dad, Mr. Kippers, has a propensity for quoting Shakespeare. And yes, he has me studying “The Bard” too, as part of my Renaissance Bully education! 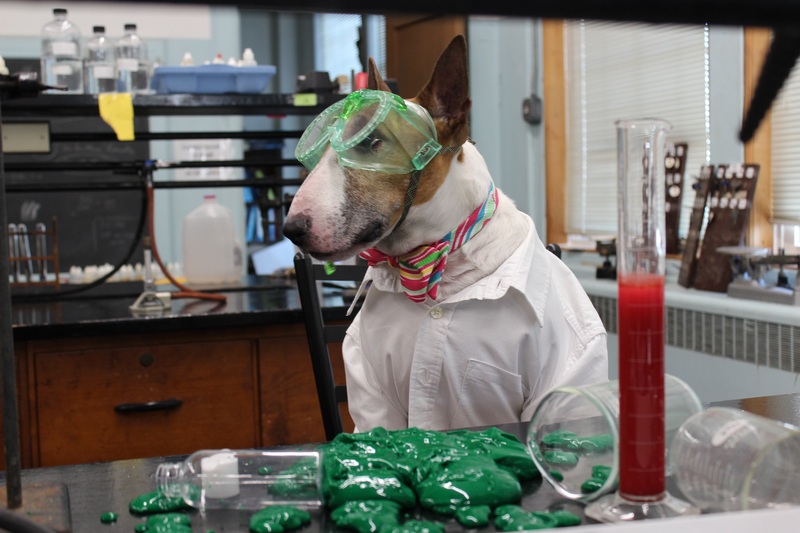 You also know that he worked very hard in his lab to make sure that I would have all of his best attributes. 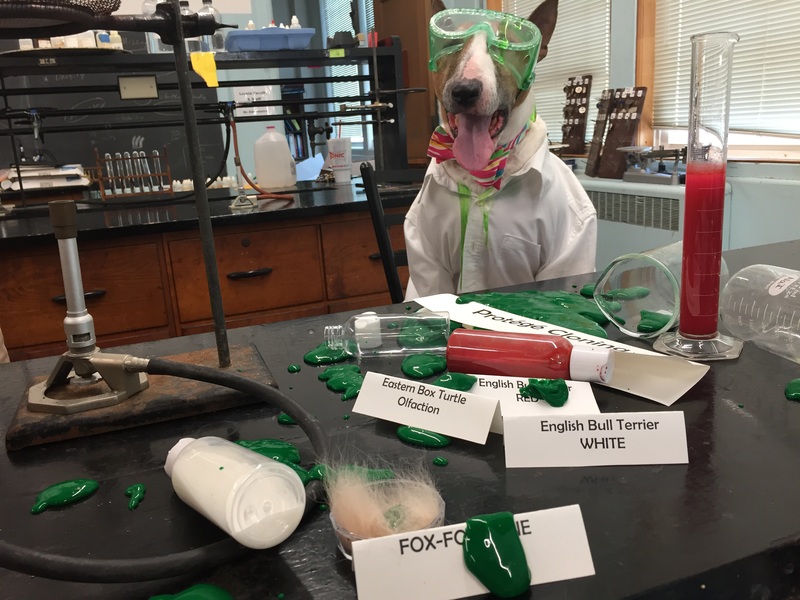 If you’ll remember, there was that little explosion in the lab and it was purported that he added too much Eastern Box Turtle Olfaction. 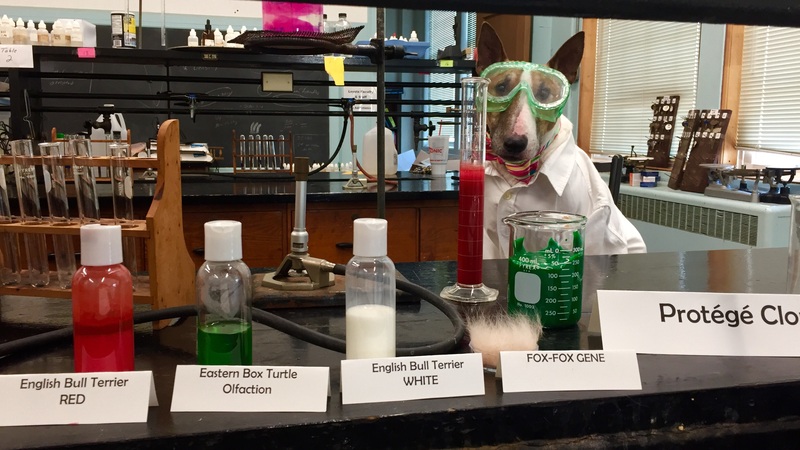 Personally, I don’t think one can ever have too much EBTO (Eastern Box Turtle Olfaction) not to be confused with EBT (English Bull Terrier). HARK! Could that be a coincidence or a harbinger of things to come? A week since the explosion, I’d been blown from the lab. Not an embryo stirring, oh boy I felt sad. The petri dishes, strewn in the grass without care, in hopes that a miracle might soon appear there. I had recovered somewhat and was snug on the couch, while visions of protégés made my heart “ouch”. Sophie in her pearls , and I in my bow, I could not get settled and tossed to and fro. 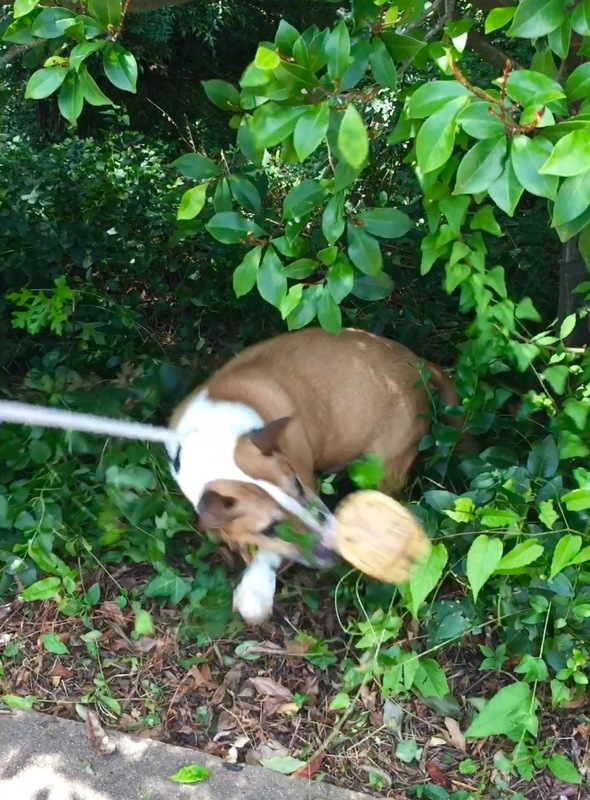 When out in the vinca I heard a strange sound, I “hucklebutted ” from the couch and spun all around. I raced to the window I saw only haze, you know I’m height challenged, was I just in a daze? The sun it was shining on the ground cover below, yet I saw faint images which gave off a glow. There in the vinca through the haze did appear, two “turtlish” creatures though I could not see clear. What were these creatures appearing slow and inept? One was the Galapagos with a side kick I’d bet. It had an egg head and it started to moan, I knew in a moment it must be my clone! “Now! Turtle #1, now! Turtle 2, now! Turtle 3 and Four! 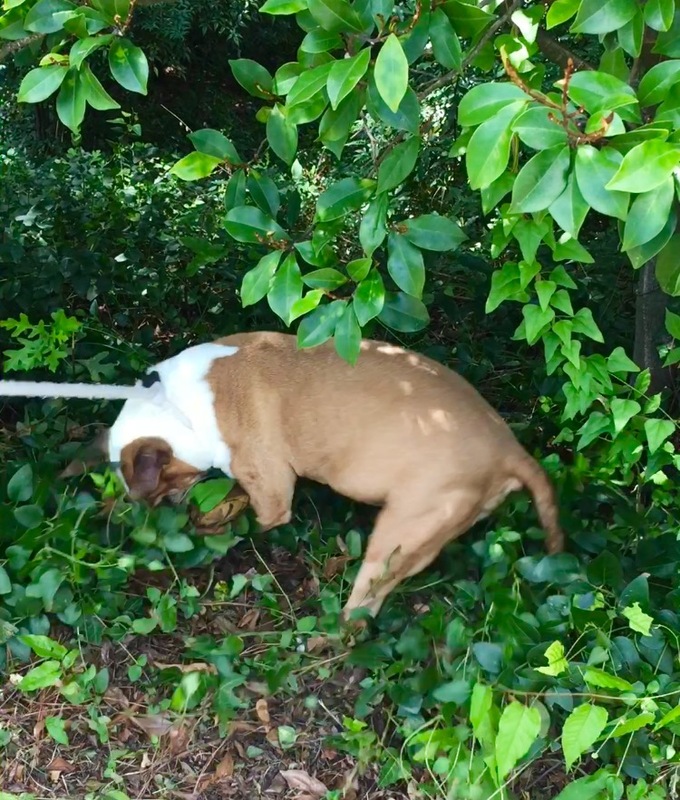 “To the depths of the vinca ! 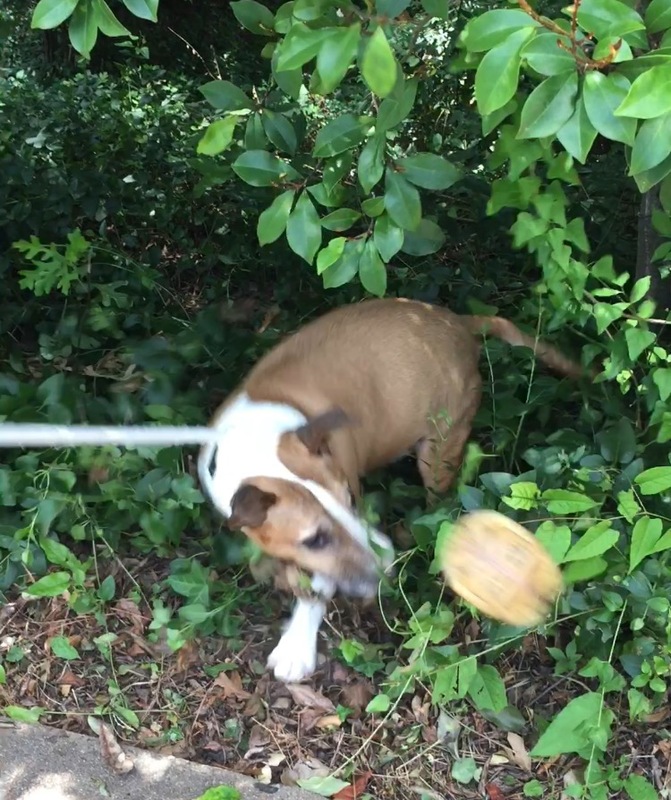 To the depths of the yard! “Come see this miracle I found with a card. Come quick, come quick, come quick one at all! 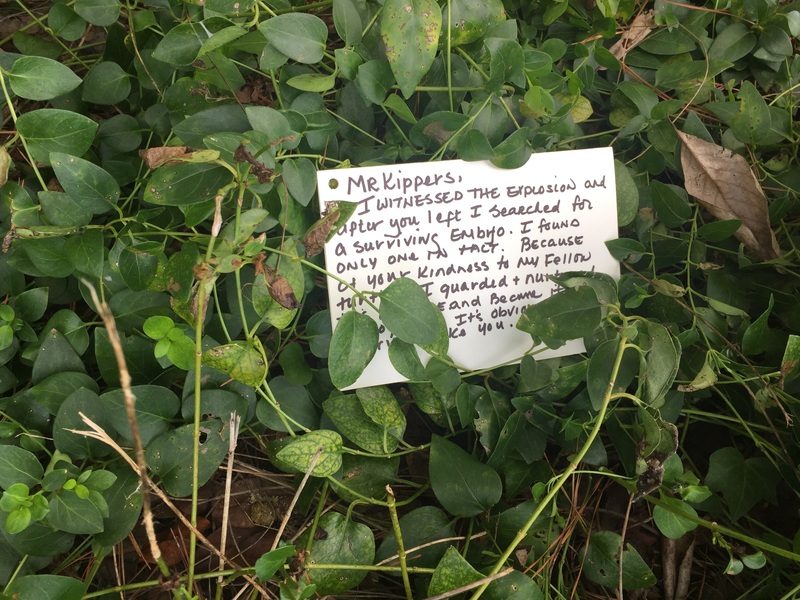 When I got down the stairs and out in the yard, my turtle friends had appeared and were surrounding the card. The Galapagos sadly, had just disappeared, but the note that she left–music to my ears. I was sent here from the islands for a purpose. That’s why you saw me, I was not a dream. I witnessed the explosion and after you left, I searched for surviving embryos. I found only one intact. Because of your kindness to my fellow turtles, by implementing your catch and release program and all you do for animal rescue in general, I guarded and nurtured this wee one and became its surrogate. 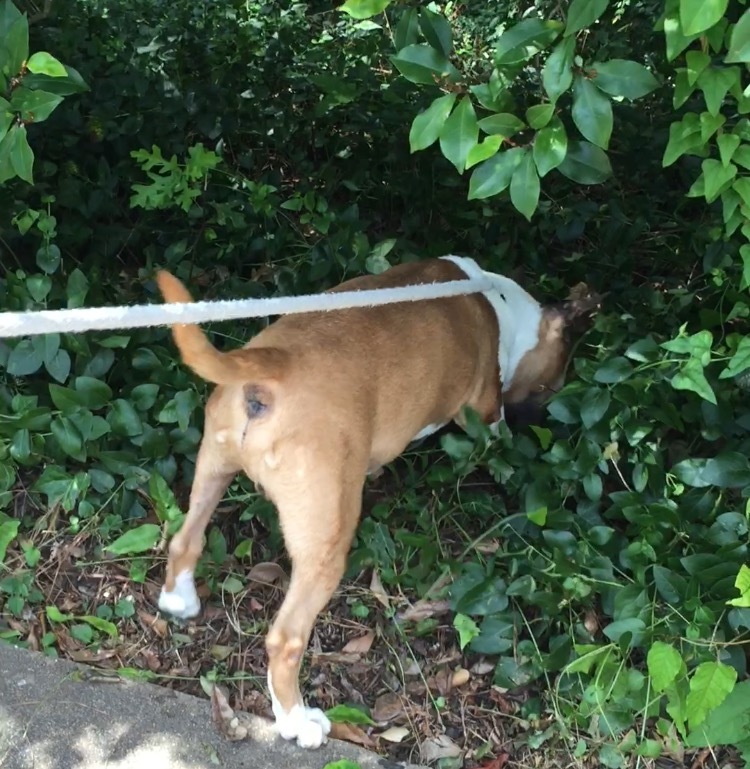 It’s obvious that he is a survivor, like you, to have lived through so much and thrived. I dressed him in the camouflaged colors of my clan to keep him safe from predatory hawks. He is our gift to you. He has all of your attributes and should be able to follow in your paw prints one day to take the helm of Classic Kippers. We have named him Kirby FitzKippers. Kirby an old English name meaning church village. A blessing he is and we shall be his village and watch over him. Fitz of course means “son of” and he is most definitely your son. My time here is finished. Teach him well. Galapagos + Cloning = ? 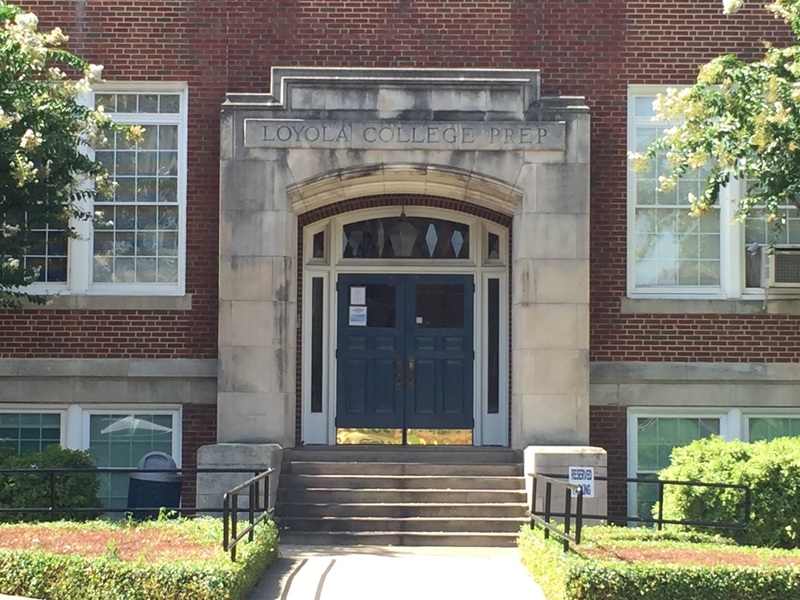 Loyola is beginning its 2016 fall term, which means they need their lab back. The contractors will finish repairing the damage by Friday and the lab will be good to go by next Monday. 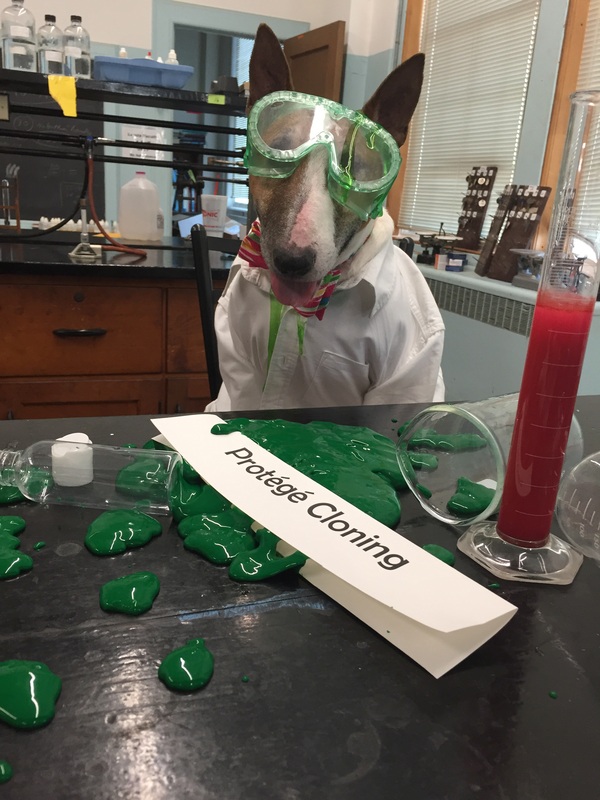 I am indebted to chemistry teacher, Laura Woolbert for allowing me to use the Loyola College Prep Lab, to Coach Bill Keel for setting everything up and making the introductions and to Dr. Aloysius Vaughn Braatenhorst, MD, DVM, BTCD for his invaluable guidance in cloning. Together Dr. Braatenhorst and I figured out that the turtle/tortoise olfaction was definitely the culprit of both explosions. It was not in anyway, terrorism, but rather the unstableness of the component. I have been in an absolute green funk since this last explosion. 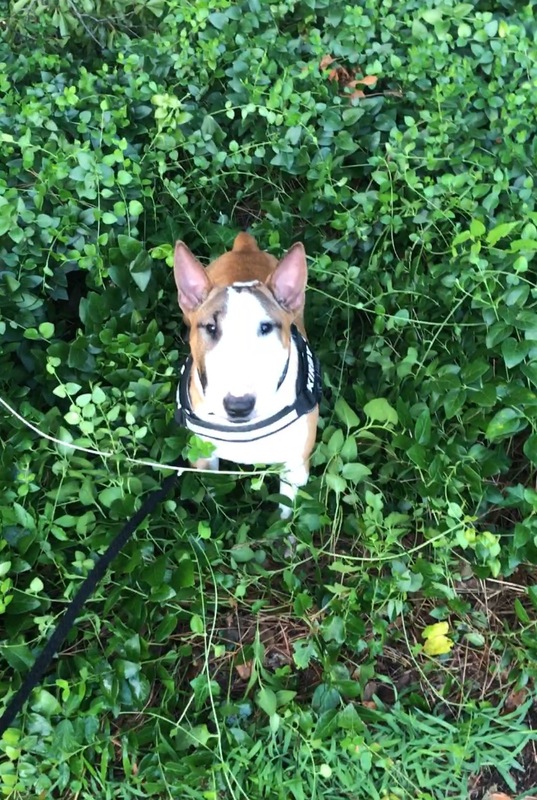 I knew that I added a smidge too much bull terrier white. Ok, it was more than a smidge, but the only effect of adding too much white would be the clone’s coat color. But the green turtle olfaction – completely another story. My Waterloo. The travesty is that the embryos were ripe, so to speak, and ready to be implanted into a surrogate. I was THAT close. 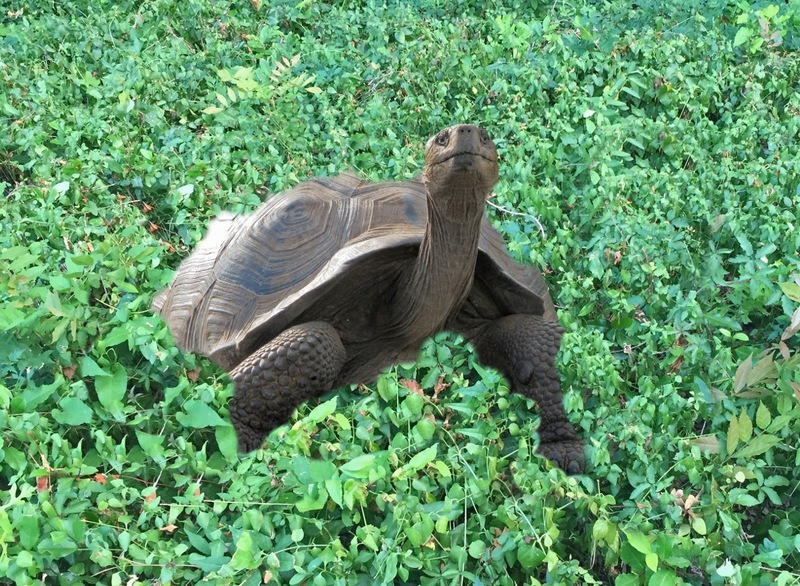 By the way, I told y’all that I saw a Galapagos Tortoise walking around the area where the embryos and I landed. Some tried to convince me that it was a dream. Well it wasn’t! Look what I picked up on the Animal Cam this morning . What does one suppose this creature of islands is doing in Louisiana? Hmmmmm….. It is with a heavy heart that I announce another “boo-boo” in the cloning lab. Truthfully it should be labeled a “major oops”. I am beginning to think that the turtle olfactory is an unstable component. It was no doubt the catalyst for the first explosion and I believe that it was for this one as well. 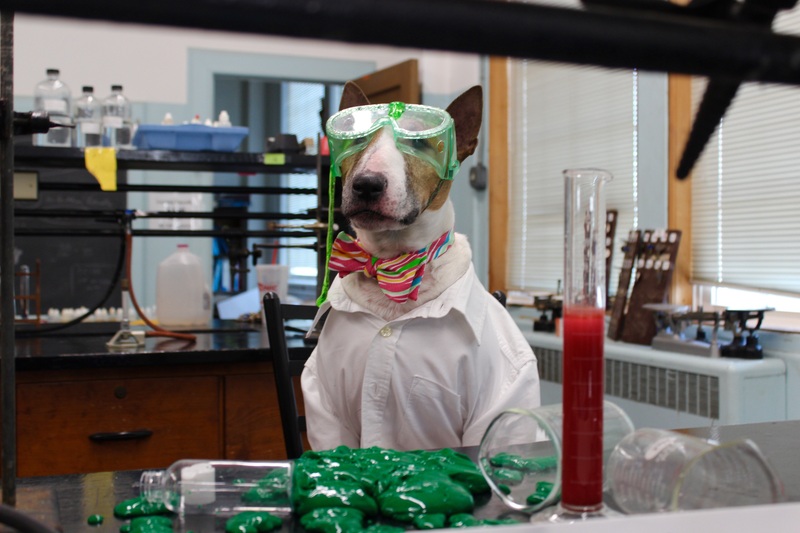 Fortunately, I have Rent-A-Lab insurance to cover damage to the lab, which was thankfully minimal. Unfortunately, this time all of my petri dishes, containing the embryos, as well as my DNA samples, “MOI” and the laboratory window just blew out of the lab. 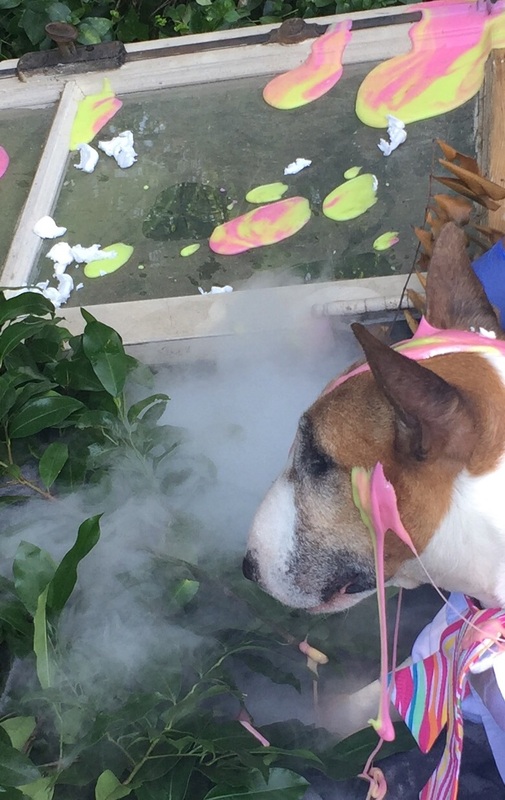 I’m afraid that I was left dazed amid the smoke and slime of the disaster. Of course, I’m certain that anyone would be dazed having landed on one’s bum after being jettisoned, unceremoniously, out of a window. I just stood there in disbelief! I was so close to my goal. EMS said that I lost consciousness for a few moments, but I’m not certain that they were correct. 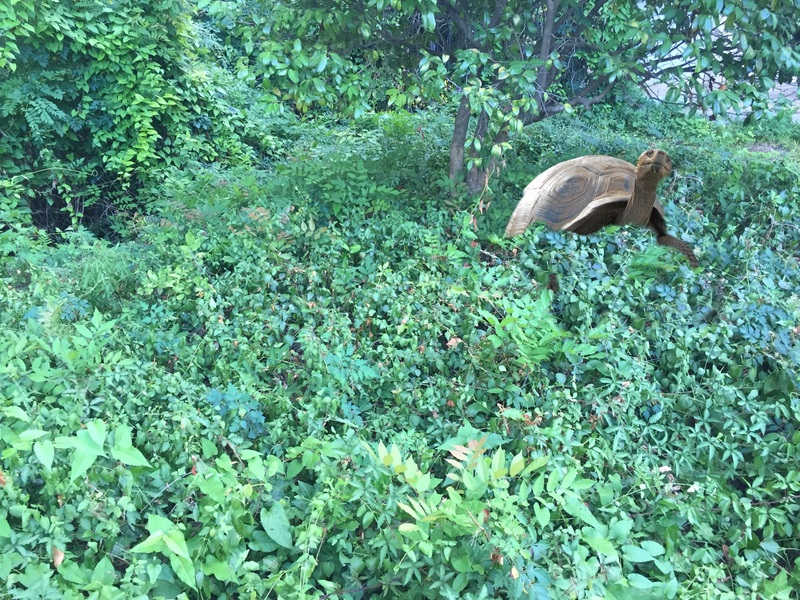 I kid you not, I know I saw a Galapagos tortoise walking around me. Seriously! Or was it just a bizarre dream? I mean I DO know what a tortoise looks like! 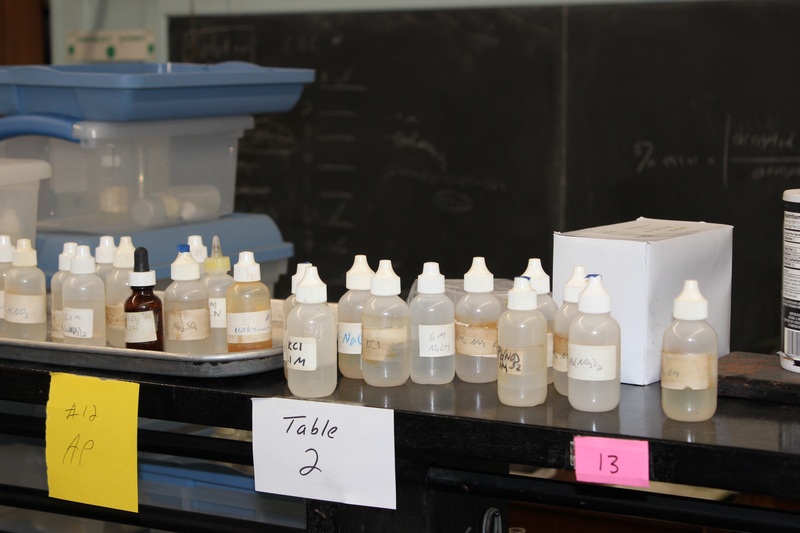 I sat in the ground cover, next to the lab window, covered in cloning residue, while trying to decide what to do next. All of my little “mini-me” embryos scattered around me. What I need is a miracle! I do want to thank baby sister Sophie Peach for racing over when she heard the news flash. 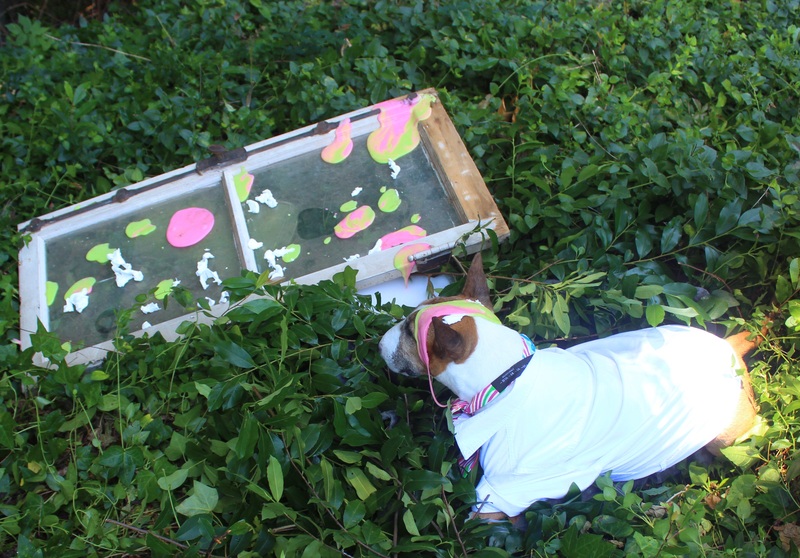 She is an intuitive little scamp and knew that it was most likely the lab in which I was working. On the other hand, she really didn’t have to bring Mom’s camera to document the disaster. SHEESH! The part that hurts the most is that the embryos were ready to be implanted into a surrogate. 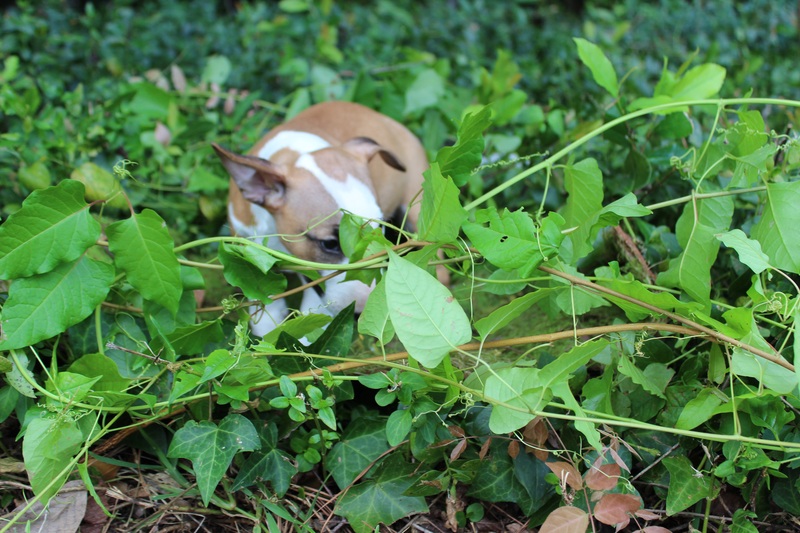 Now they are strewn all through the ground cover. Yep a miracle is what I need. A “bone fido” miracle. 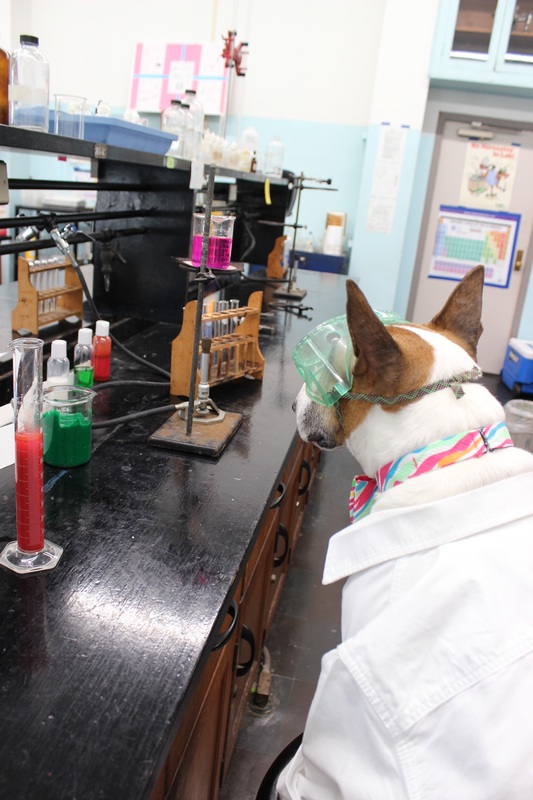 I know that I have been dragging my paws getting back into the lab, but this hundred degree heat is sweltering! Of course, having humidity that topped 96% last night was, well, simply unacceptable to my delicate sensitivities. However, Mom had a little chat with me over the weekend. She told me that my procrastinating was going to get me into trouble, as I only have two weeks left before Loyola will need their lab back for the beginning of the next school year. She also said that the best way to get something done is to begin. So I did. Monday morning found me in the lab where Phase One is now underway. 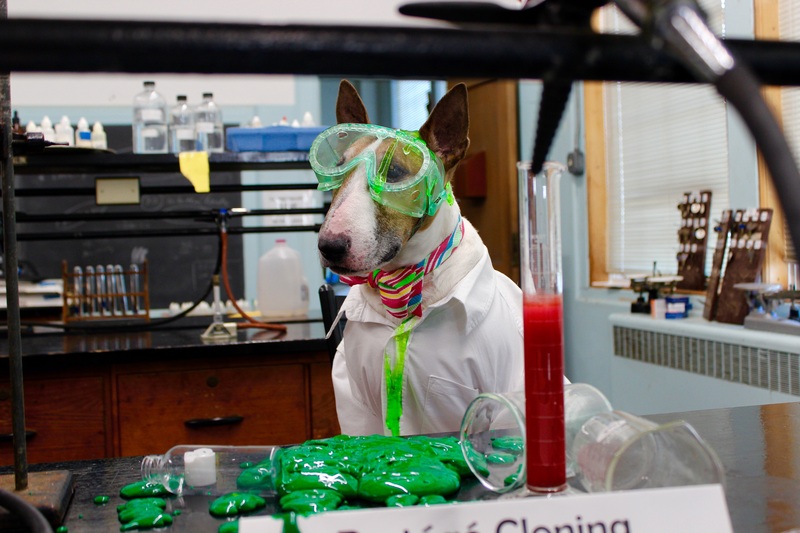 First I put on my lab coat & eye protection. Everyone knows that I am a stickler for safety equipment! One never knows when a mishap might happen! I also wore a snappy little Classic Kippers’ bowtie. After all, it’s been proven that dressing for success leads to success and it’s imperative that I am successful with my cloning. My mother has been asked, by more than four people, why she would spend $180,000 to have me cloned. Let me assure each and everyone of you that my mother is NOT paying to have me cloned. She told me early on that it was my baby- figuratively end otherwise. Of course being good parents, they are cheering on my project and me. At that point I was ready to begin. It was necessary that I began with coat color. 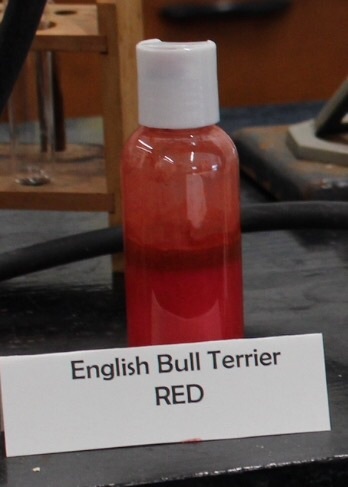 First I mixed large portions of English Bull Terrier Red with lesser amounts of English Bull Terrier White which would add the “chrome to my clone”. “Chrome” being the white blaze, white collar, as well as white paws/legs. It was imperative that those proportions were precise! Next I added a healthy portion of the “Fox-Fox” gene. As one would be aware from having read my previous post, the “Fox-Fox” gene is what makes me ALWAYS camera perfect for my photo shoots. I added a healthy measure of that to my cloning process. 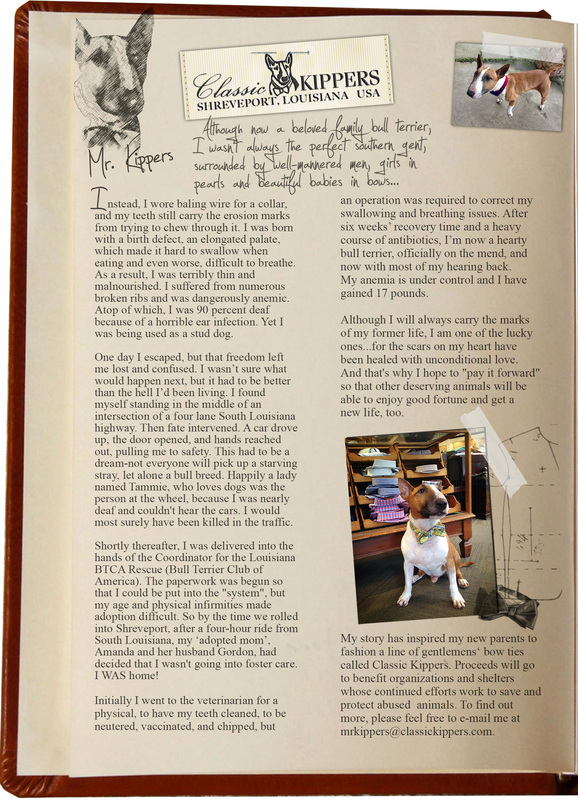 Attributes of gentleness, heart and philanthropy were added too, plus the usual quirky bully genes. 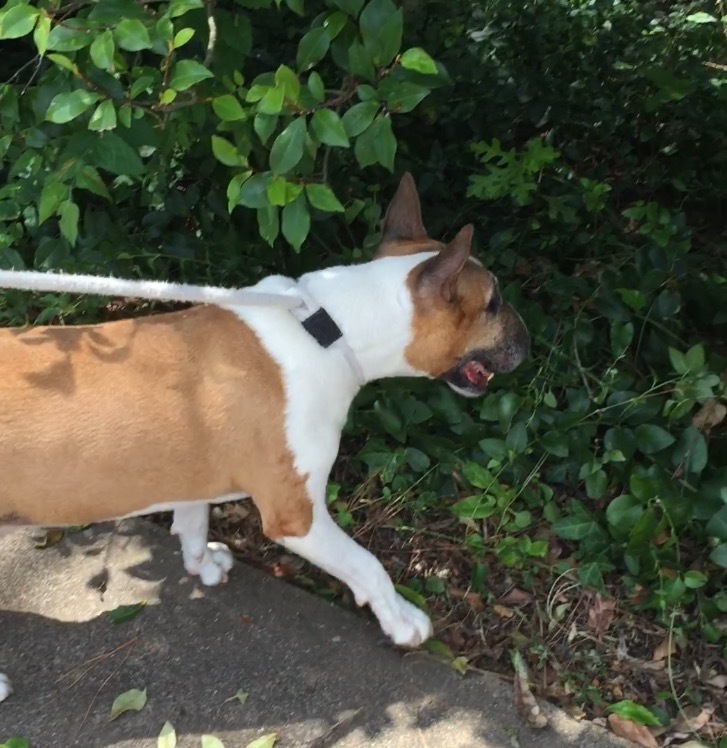 I mean after all, without all of those genes a bully would just be, well, and ordinary dog. And what would I be like without my incredible sense of style? 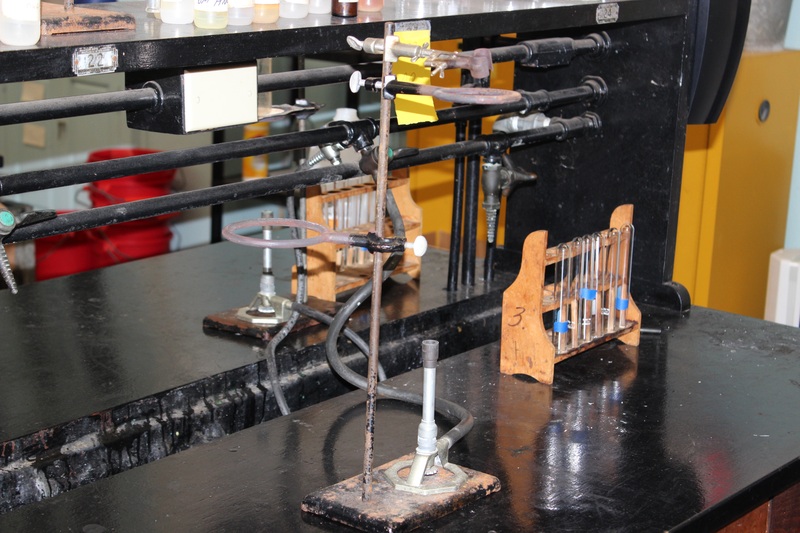 I’ve had THAT working on the Bunsen burner! Dad has emphatically stated that my clone must be very small so that mom can handle him. 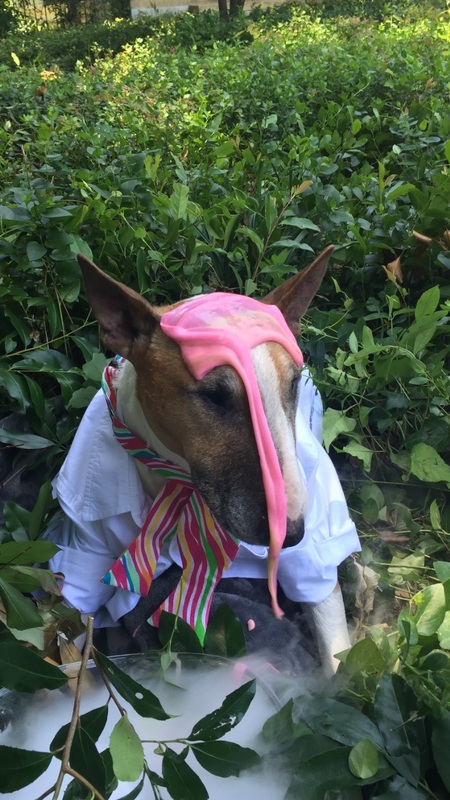 Although I am small for a standard English bullterrier, I need to make sure that genetically there is some “Lilliputian” DNA included. I pondered this point for quite some time as I had absolutely no idea what to do and then I remembered about my awesome friend HARRY! Yes, everyone’s wild about HARRY! 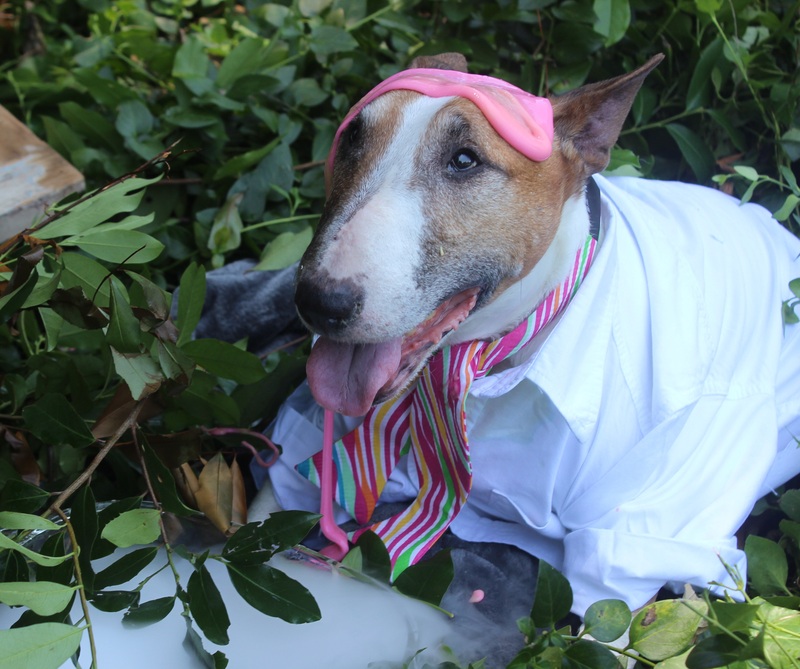 In the bullterrier world he is somewhat of a small fry, but inside that diminutive statue resides one who, like “moi”, is an ambassador of goodwill for the breed! I immediately contacted HARRY who graciously overnighted his mitochondrial DNA. It has been added. Because this is a new beginning, I added the beauty of the Sunrise. 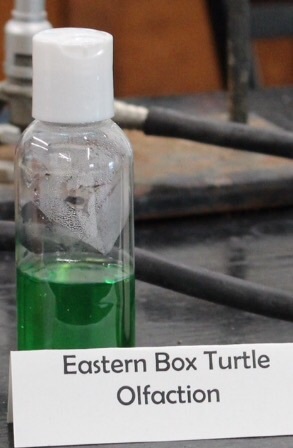 The difficult part was deciding how much turtle olfaction should be added. One should be aware that a dog’s sense of smell is about 1,000 to 10,000,000 times more sensitive than a human’s (depending on the breed). 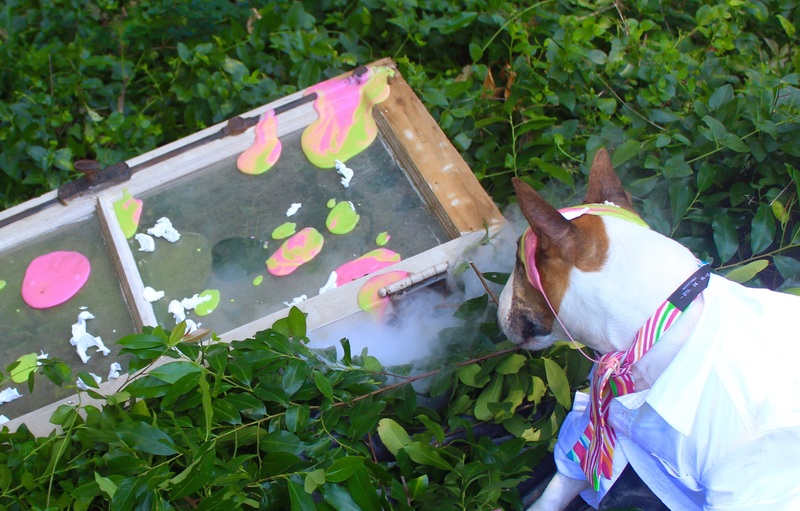 A human has about 5 million scent glands, compared to a dog, who has anywhere from 125 million to 300 million! No wonder my parents had no idea that they had so many turtles living in their yard- they are olfactory challenged! Uh Oh, I must have added an incompatible material. Why else would I be sitting here in green slime? 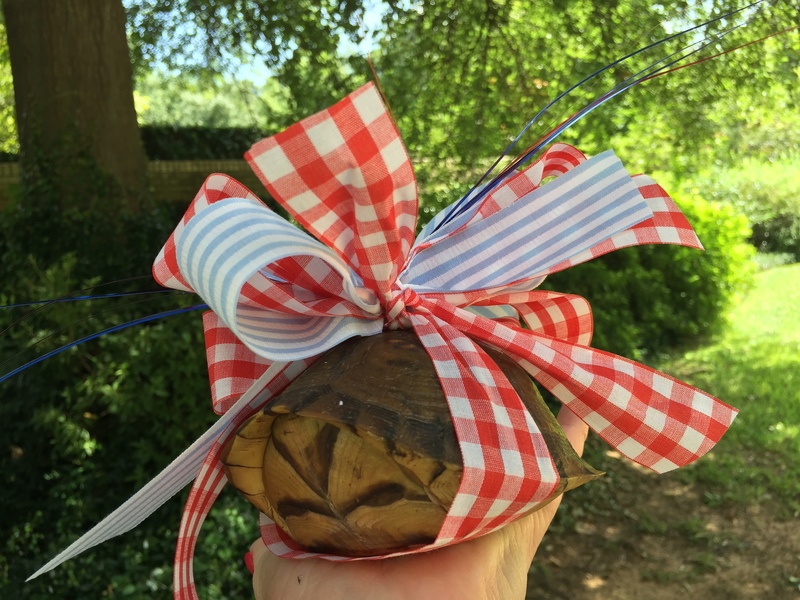 Yep, it’s turtle olfactory and it’s – as we say in the South – A MESS! 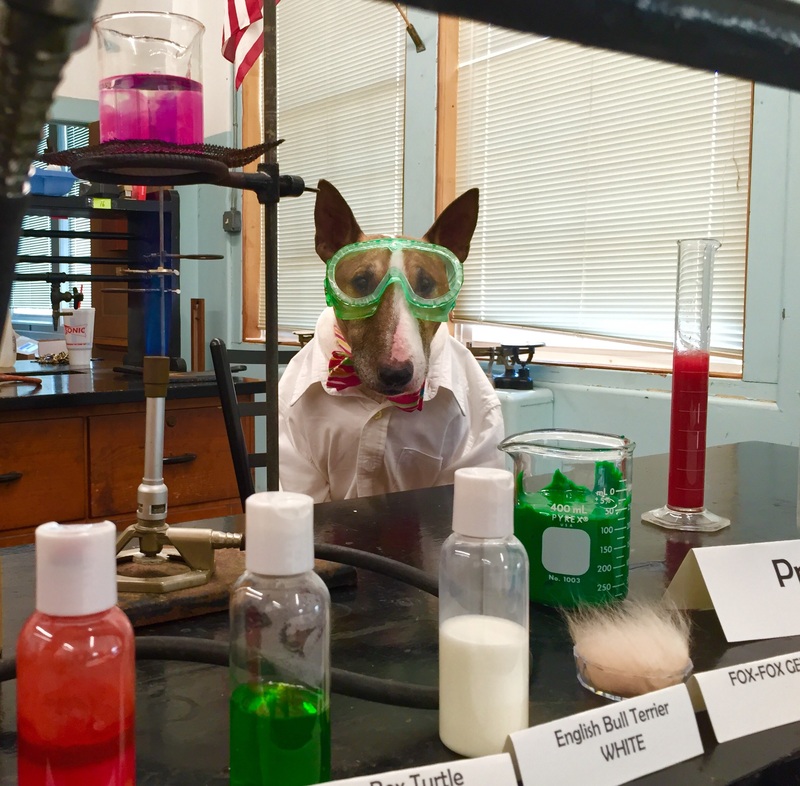 I will endeavor to find out what I did wrong while my invaluable lab assistant, Miss Sophie Peach, washes the test tubes etc. To “MOI”, cloning is akin to following a recipe of sorts -only scientific. At least that’s my theory and this is, after all, my experiment, my story, my blog and MY CLONE. That being said, it’s imperative that I explain, first, what “ingredients” I intend to add to the “recipe” for my protégé. That way, those of you who are following the cloning will have a thorough grasp of some of my most important genetic makeup. Of course there are clones produced by the DNA from embryos, as well as those produced from an adult cell. The latter is much more difficult than embryonic cell cloning. The cell will be injected into an unfertilized egg cell which has had the nucleus removed. Then of course WE (I may allow little Sophie Peach to be my lab assistant) will culture it for six or seven days to see if it will divide and develop normally before implanting it into a surrogate mother. Through my studies I have learned that some clones are not entirely identical to the genetic parent. That is because the mitochondria, kept outside the nucleus, can inherit from its egg donor mother. 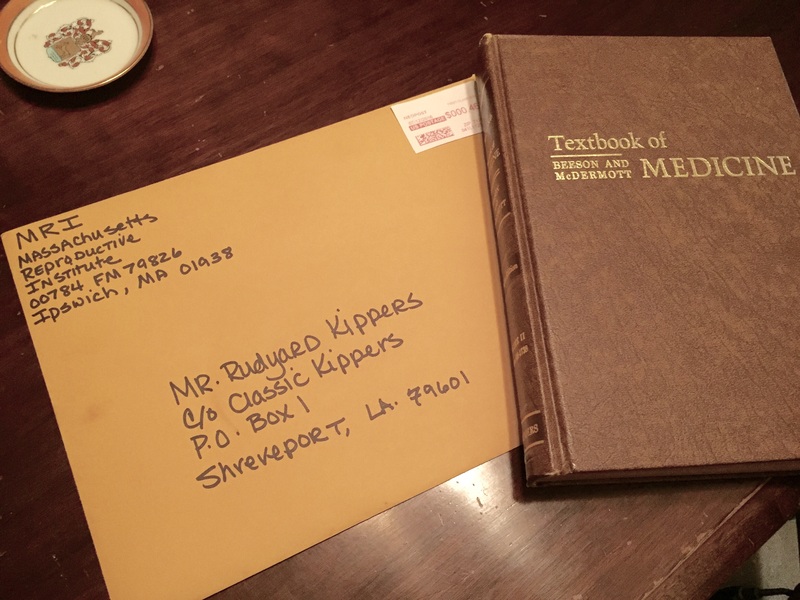 It’s rather complicated, but the Massachusetts Reproduction Institute, from where I am taking my correspondence course, does an excellent job in explanation. Before I begin the actual cloning work, I thought it would be best to give y’all a peek into what will become my “sanctuary” for the next few weeks. 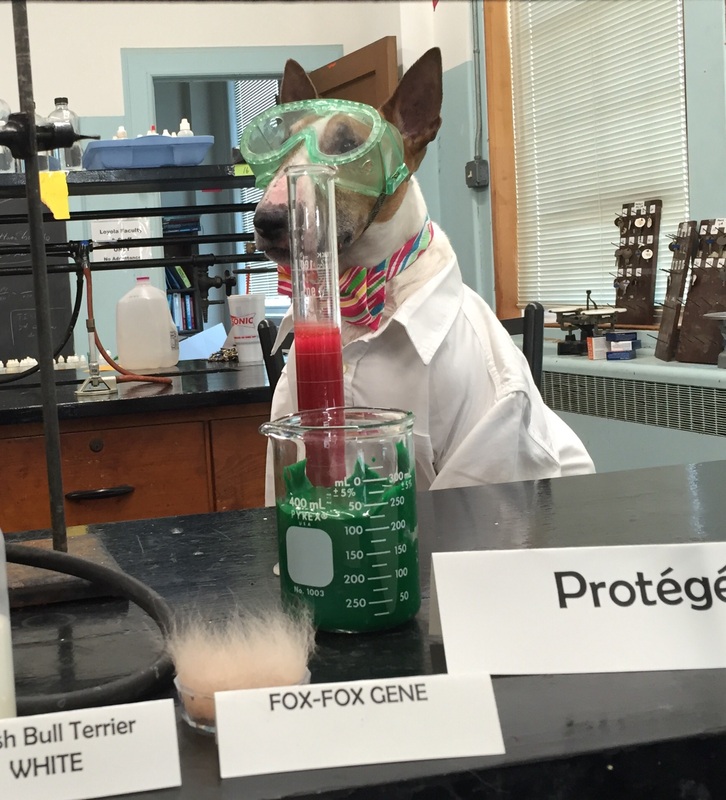 Thank you again LOYOLA COLLEGE PREP for allowing me to use your laboratory. 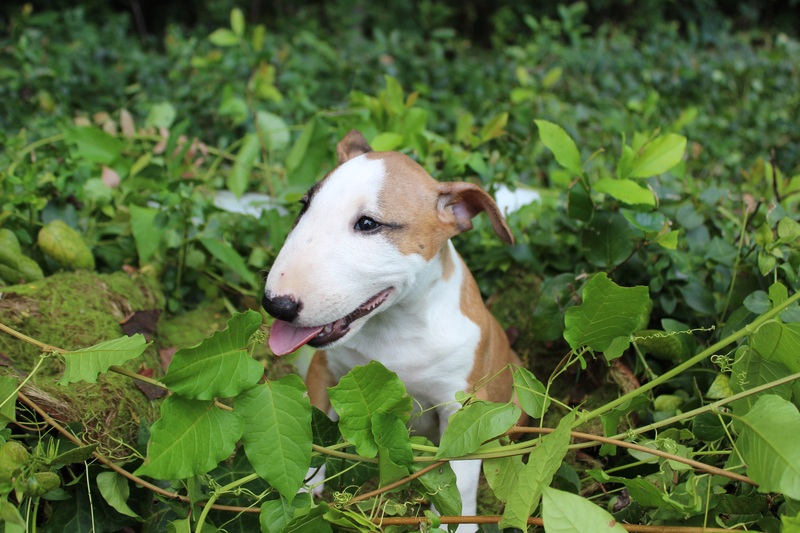 English Bull Terrier Red- (coat color) After all, a Herring when cooked, becomes red in color and is called a Kipper! That would be “MOI”! 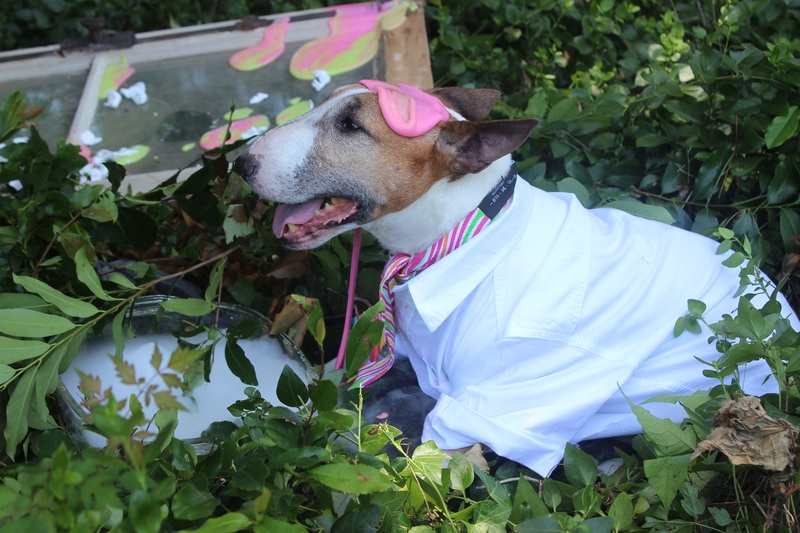 English Bull Terrier White- (coat color) It is imperative that my clone have a white “collar”, like I, so that all of my Classic Kippers bow ties show up properly when modeled. 1. SMELL- Eastern BoxTurtle Olfaction- now we wouldn’t want a clone who couldn’t carry on my prowess hunting turtles would we? 2. 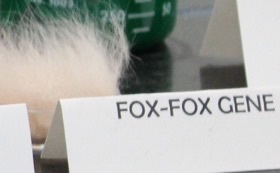 SIGHT & HEARING- Fox-Fox Gene- those of you who are personal friends are aware of “Fox-Fox”, but for those who do not see me often I must explain. I have long had an obsession with a certain fox tail which Mom keeps in the vestibule closet. When I hear the words “Fox-Fox” my ears go up and I race to the closet. I elicit the same response when I see the fox tail. Whether I see it at a photo shoot or I hear the words “Fox-Fox” I perk up! It’s the trick to my awesome photos, so naturally it is imperative that the “Fox-Fox” gene be included. 4. TOUCH- “Pay Forward” Gene- the desire to reach out and “touch” those less fortunate. Isn’t that what Classic Kippers is all about? 5. TASTE- Sense of Southern Style Gene-( good taste) you either have it from birth or you don’t. It’s a plain and simple fact. Basically to a Southerner, good taste is the opposite of “Tacky”. Southerners understand two very important phrases “It’s tacky” and “Bless his/her/your heart” – both are often associated with taste. 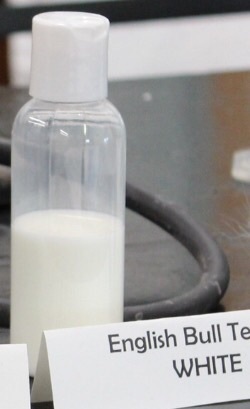 Of course these are just some of the genetic materials which will go into the embryo to produce my protégé! LABORATORY SECURED! Full speed to cloning! 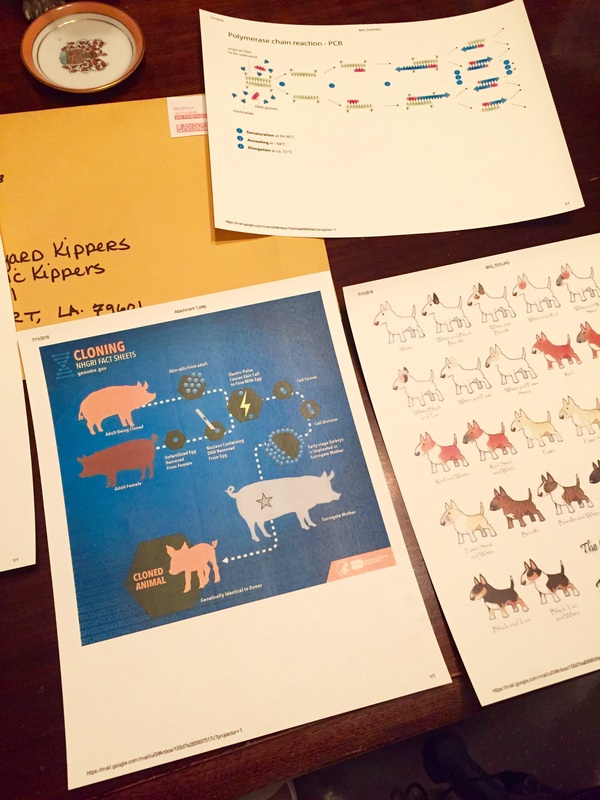 The mailman, excuse me – “postal person”, delivered my correspondence course material on cloning yesterday! I am taking my course, Me, Myself & I -Cloning For Beginners from MRI (Massachusetts Reproductive Institute), in Ipswich, Massachusetts. I am terribly impressed with the course material. When I signed up, I had to choose between a pig or a sheep to be used as my example. 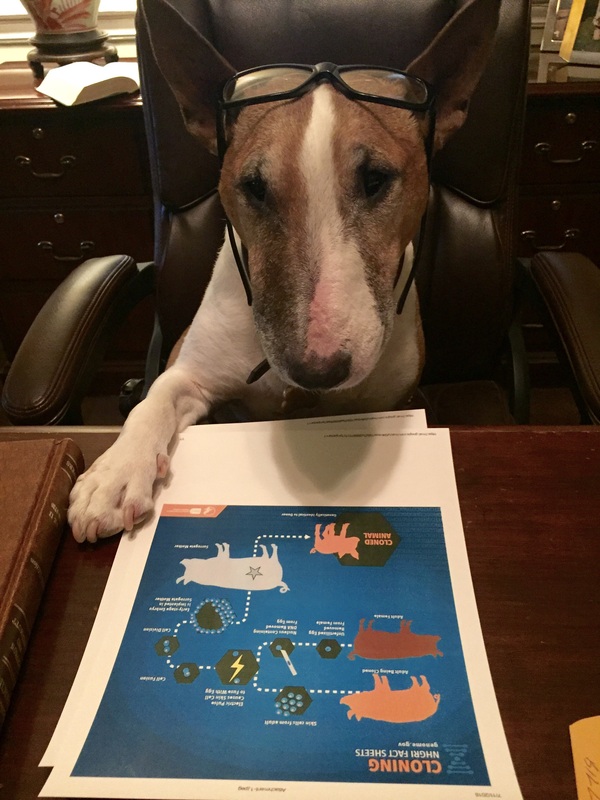 Of course, because we are called “pig dogs”, I chose the pig example. My goodness! 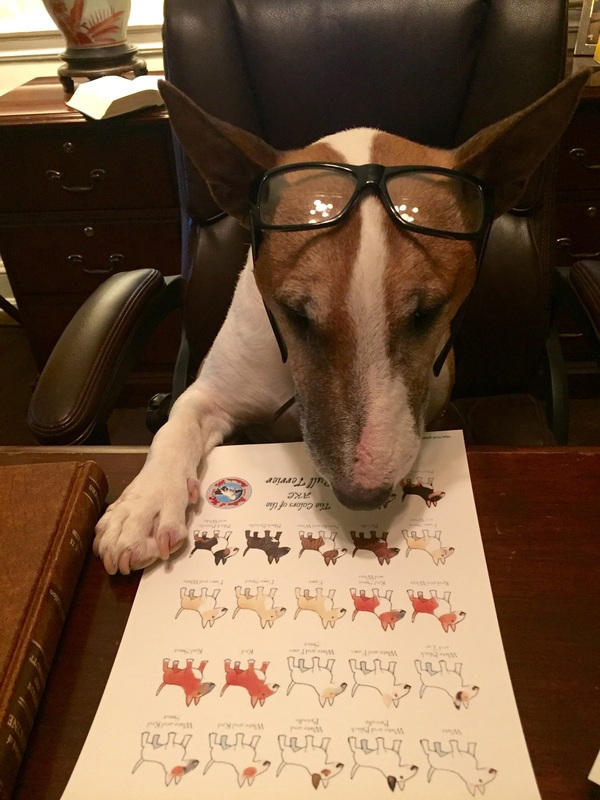 MRI even included information from the AKC English Bull Terrier color chart which will help immensely! I had spoken to MRI earlier and explained my situation. I told them that I was not trying to get a degree in biochemistry/cloning per se, but that it’s imperative that I find a protégé in short order. After all, my “mini me” will have to grow and develop. Now for the super exciting news! I have finally secured a laboratory for my personal use! I will now, very shortly, be able to put to work those things which I am learning. 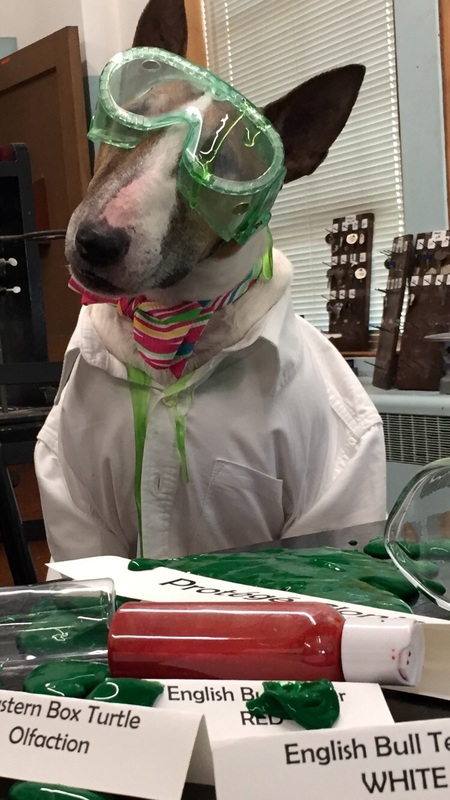 Now, I’ll bet y’all are itching to know which lab. You see, the LSU Med School laboratory is in use daily, so naturally I needed a place where I can work, undisturbed of course. 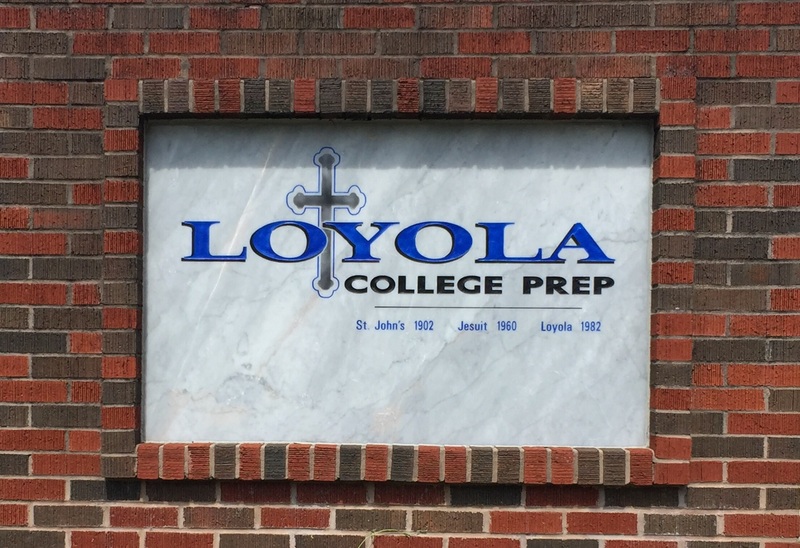 LOYOLA COLLEGE PREP graciously responded to my request to use their facility. Since their students are out of school for the summer, it will be ideal! I’m going to be finishing up with my book work by tomorrow evening and will then begin my lab work. First, clones do not always look identical. Although clones share the same genetic material, the environment also plays a big role in how an organism turns out. Secondly, in reproductive cloning, researchers remove a mature somatic cell, such as a skin cell, from an animal that they wish to copy. They then transfer the DNA of the donor animal’s somatic cell into an egg cell, or oocyte, that has had its own DNA-containing nucleus removed. Bless my genes and DNA! I am finding my cloning course to be rather intense, but I’m certainly up for the challenge, as I am hell-bent on cloning “MOI”. Unfortunately, I’ve run into a couple of stumbling blocks. The first was obtaining a library card. Are you aware that only service dogs are allowed in the library? How terribly insensitive to those of us who are trying to further our education. I wasted my first night brooding over how I would ever be able to do research without admittance to a library, but mom reminded me that we have a well stocked library in our home an Internet capabilities. She also gave me permission to use her home office and computer and said that I could take cloning courses online. Despite having wasted the first 24 hours of my mission, trying to get into the public library, I signed up for my first Internet course on cloning yesterday. 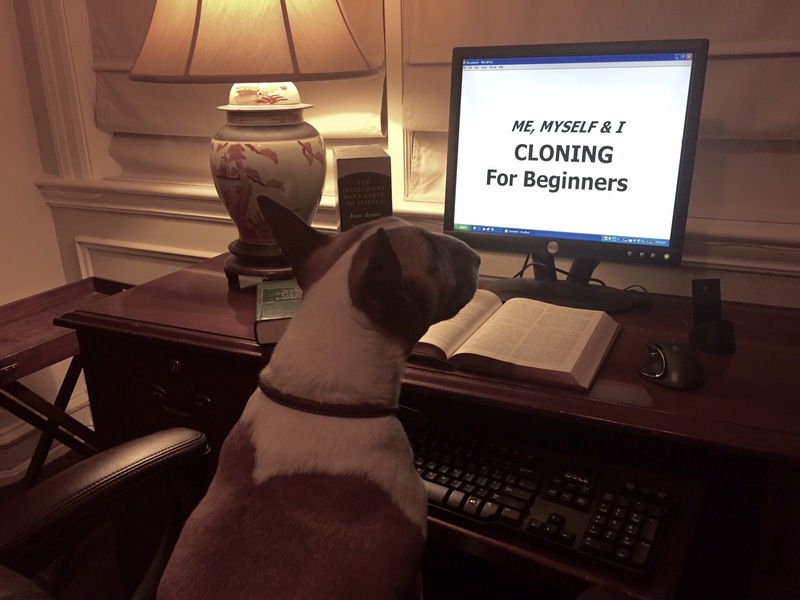 It’s called “ME, MYSELF AND I – CLONING FOR BEGINNERS”. Simply fascinating! I spent last night delving into the depths of therapeutic cloning, reproductive cloning, general cloning, embryos, in vitro, genetic defects and fertilization. It boggles one’s mind! My second stumbling block has been to secure a laboratory. 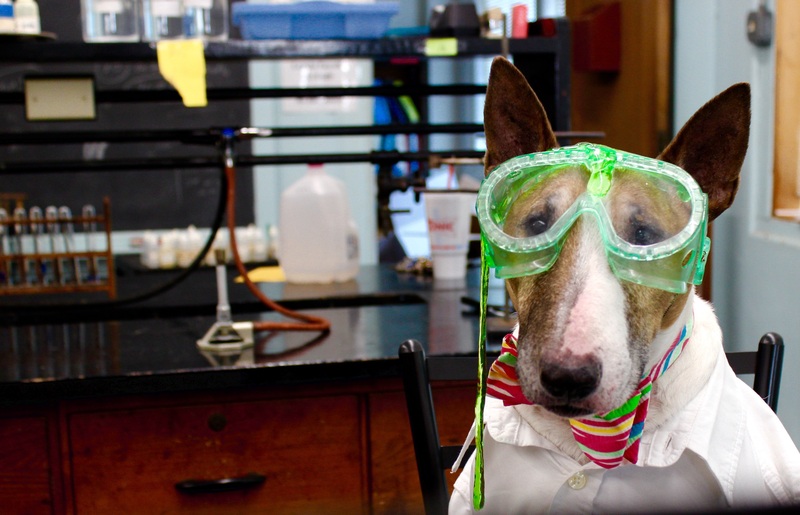 Fortunately, Mom has a friend, who has a friend, who is in charge of a fabulous laboratory in Shreveport. 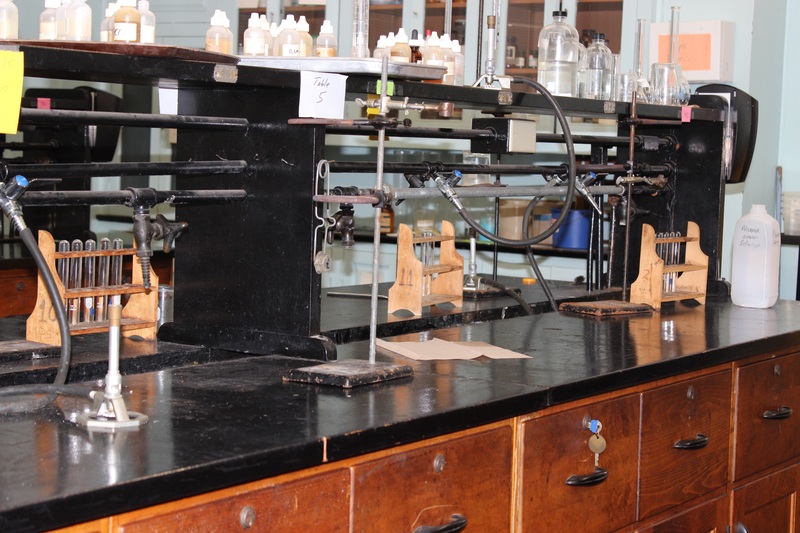 It’s an older laboratory, but one where some of the finest minds in Shreveport have been educated. 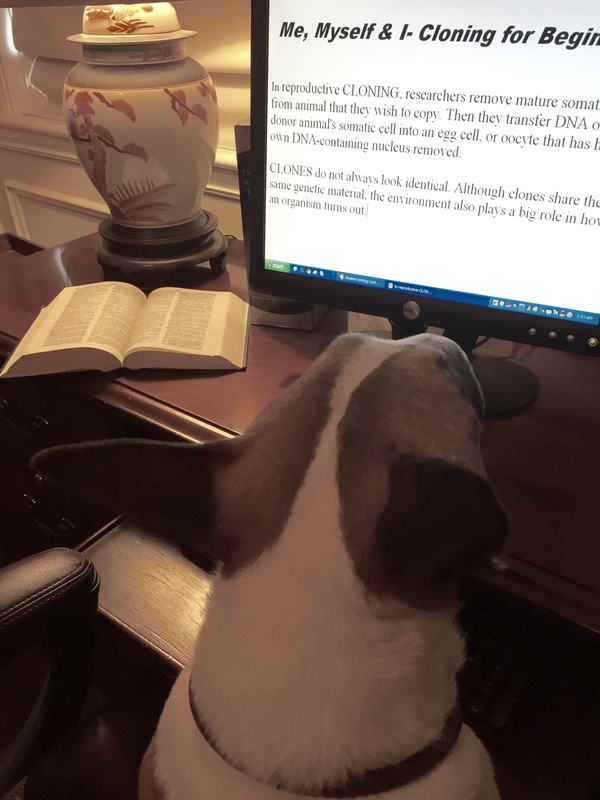 We are working out the logistics, but I am in hopes that I will soon be able to share good news that I have the use of a laboratory in which to begin my cloning process. Now, back to my studies. A NEW JOURNEY BEGINS! The quest for a protégé . Of late I have been pondering the future of my company, Classic Kippers. 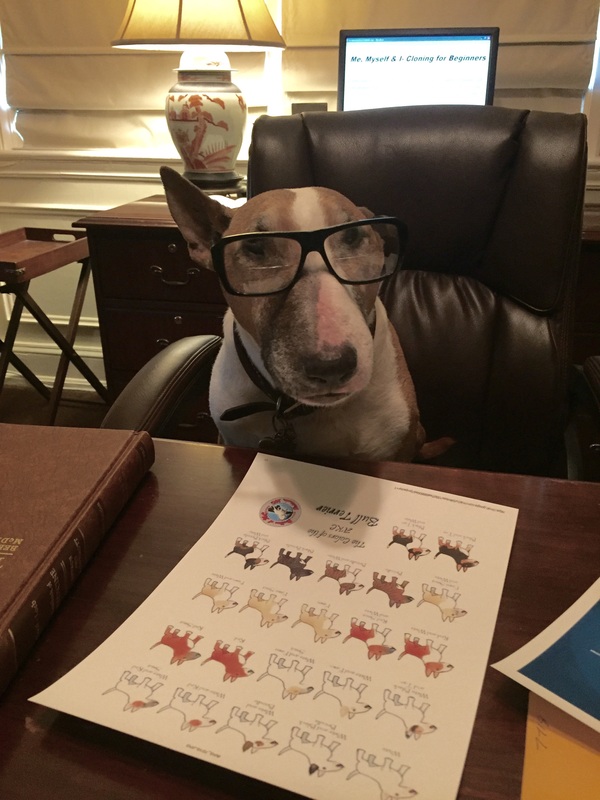 Of course I plan on staying at the helm for sometime, but let’s face it, I am long in the tooth and my muzzle is gray. Bottom line – I need a protégé. Truthfully, the duties are so vast as CEO, that having someone on board to learn the ropes from me would be ideal. I’m quite frustrated if the truth be known. Sophie Peach tried to step into my paw prints, and does certainly help in many ways, but the FACE of Classic Kippers cannot wear pearls. I mean after all, we are known for our signature bow ties are we not? 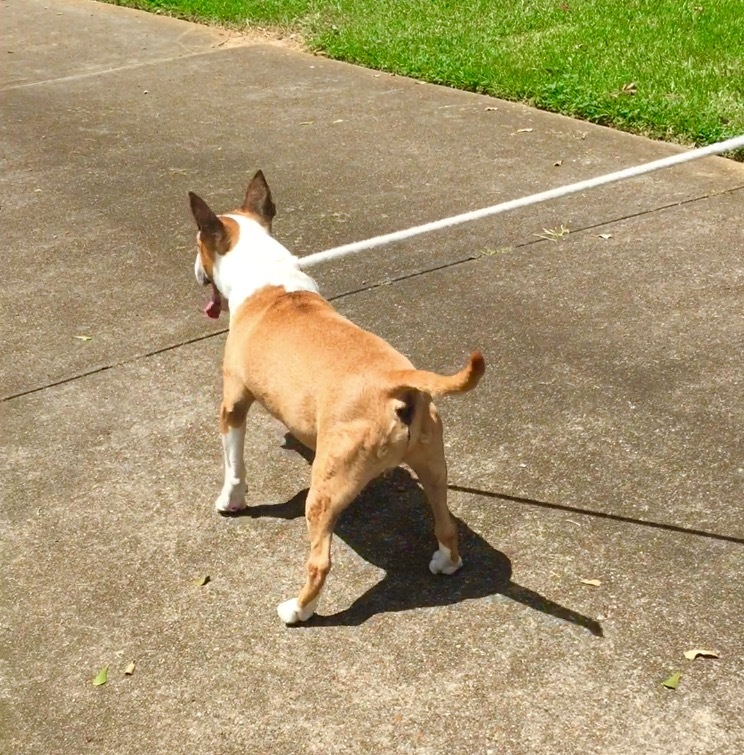 Mom has brought home potential prospects, four in fact, which she rescued from surrounding parishes and counties. A couple were entirely too bullish! They were big males who thought they were going to run the show- NOT HAPPENING! My company, my show. Despite the fact that we were neutered, it was some what of a testosterone nightmare. Let’s face it, a gonadectomy does not have total control over sexually dimorphic behaviors. SHEESH! 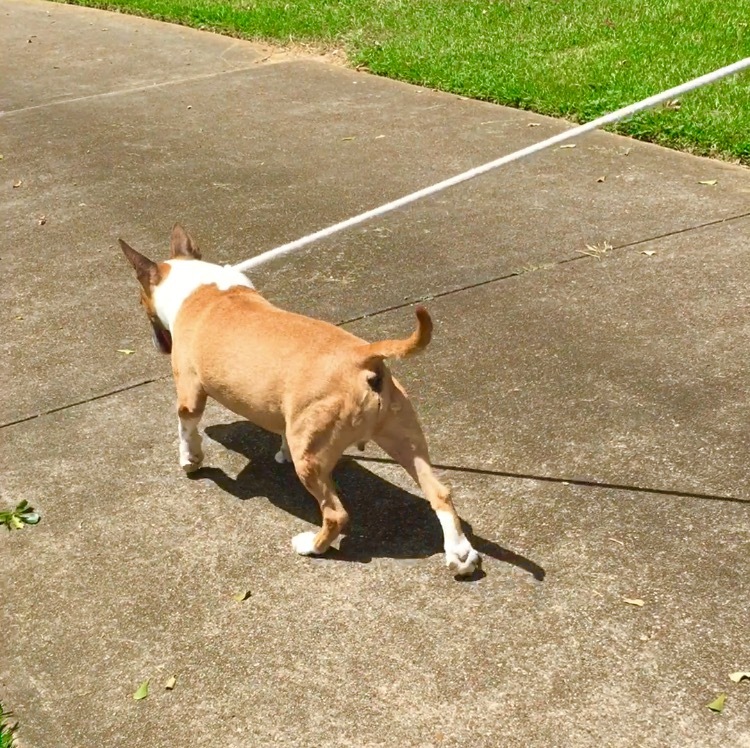 The two who appeared to have potential, we’re just too strong for my mom to handle on a lead. (Her knees are titanium you know.) 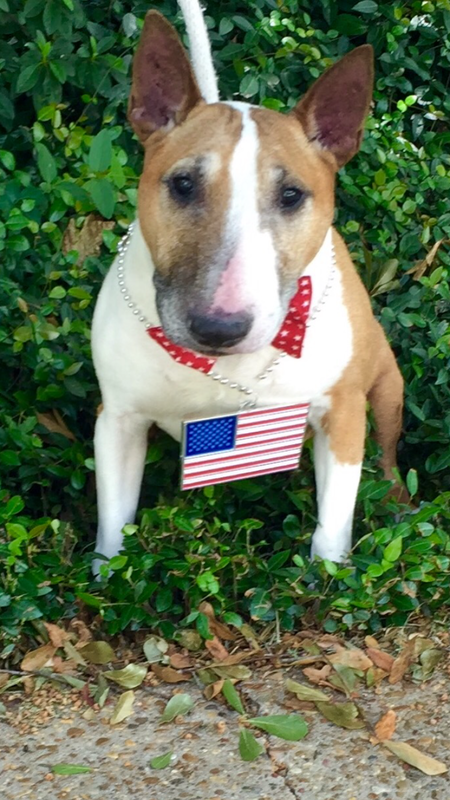 Side note: before I was rescued, all of my parent’s English bull terriers were 65-90 pounds. I arrived tipping the scales at 27 pounds. Granted I was a tad scrawny, but after proper care, I now weigh 50 pounds. 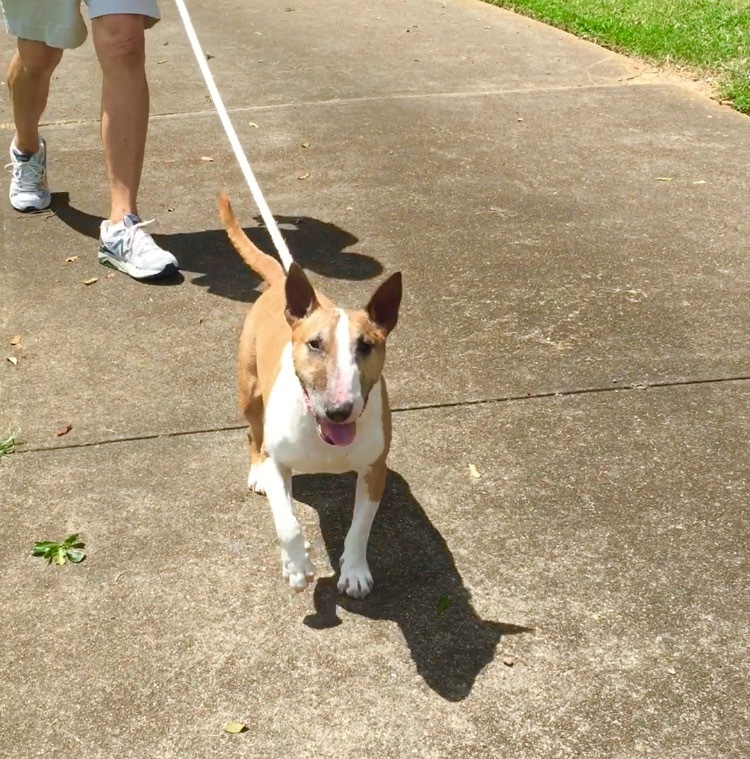 Mom has decided that English bull terriers, 50 pounds or under, are a much better size for public appearances and of course, for her to walk. It’s not to say that we don’t think those big fellas are magnificent, because we do, but we also realize that good things come in small packages – like “MOI”! Unfortunately, at twelve, I do not have unlimited time to find a protégé. Especially as I would like to train him myself. Although mom is continuing to look for a protégé through her rescue position, it’s apparent that there is only one thing for me to do and that is to clone myself. Most of you aware that I am quite the student and always enjoyed learning new things. So I shall endeavor to learn the finer points of cloning. 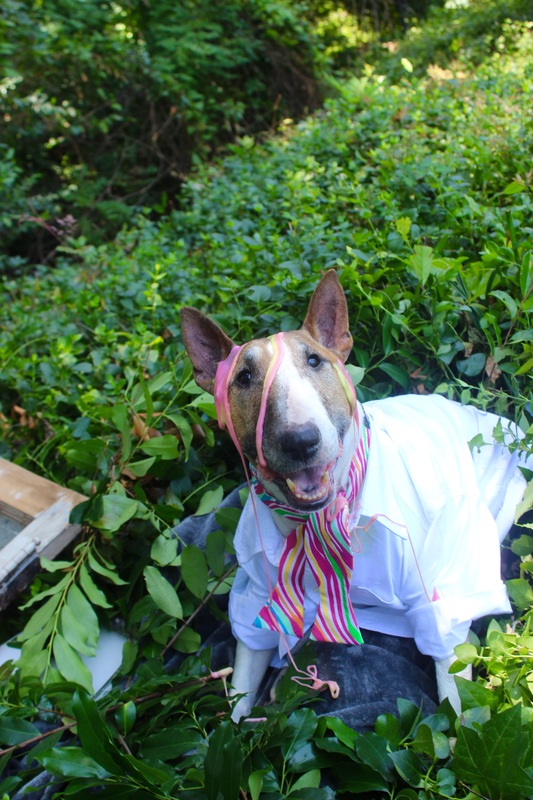 Mom and dad find my idea a bit dubious, but my mind is made up and being a hardheaded bull terrier, I’m going for it! Mom and I had quite the tête-à-tête over it, because she worries about my clone having my genetic abnormalities, but in the end I claimed victory! I’m just certain that I will be able to pick and choose the DNA make up of my protégé. I do hope that you will follow me on my journey, as I try to find the perfect protégé whether he be cloned or rescued. ” And are we not all in agreement that their should be some serious falderal to commemorate number 50 when the time comes? I need a DRUM ROLL PLEASE for this auspicious occasion. It’s true, I have caught number 50 and in fine form I might add! Not only will it be documented here for posterity, but Mom even got it on video! I know it isn’t polite to brag, but this IS turtle 50 and I AM 12, so please allow “moi” a tad of latitude. This morning was a rather normal, hot sultry day. Dad and I went for our early morning constitutional when I began to alert. Knowing that my behavior was more “turtle alert” rather than “feral cat/ squirrel alert”, Dad brought me into the house to get Mom and the camera. After all, everyone has been on pins and needles waiting me to strike on number 50, but I’ve been drawing blank since Memorial Day! I kid you not! I haven’t caught even one iota of the essence of tortoise in all that time. But today was different. Mom got her camera, set it to video and we headed out. 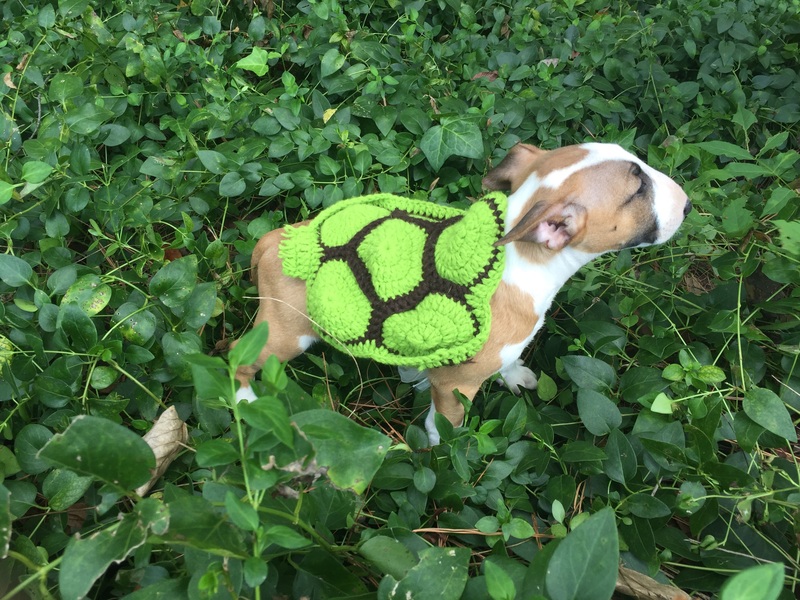 There was a slight breeze and I caught it, not the breeze- the odor of tortoise! I pranced, I trotted, I pulled , I caught him and then something that has never happened before happened! I slung my head to the left and #50 flew out of my mouth and right at my mom! 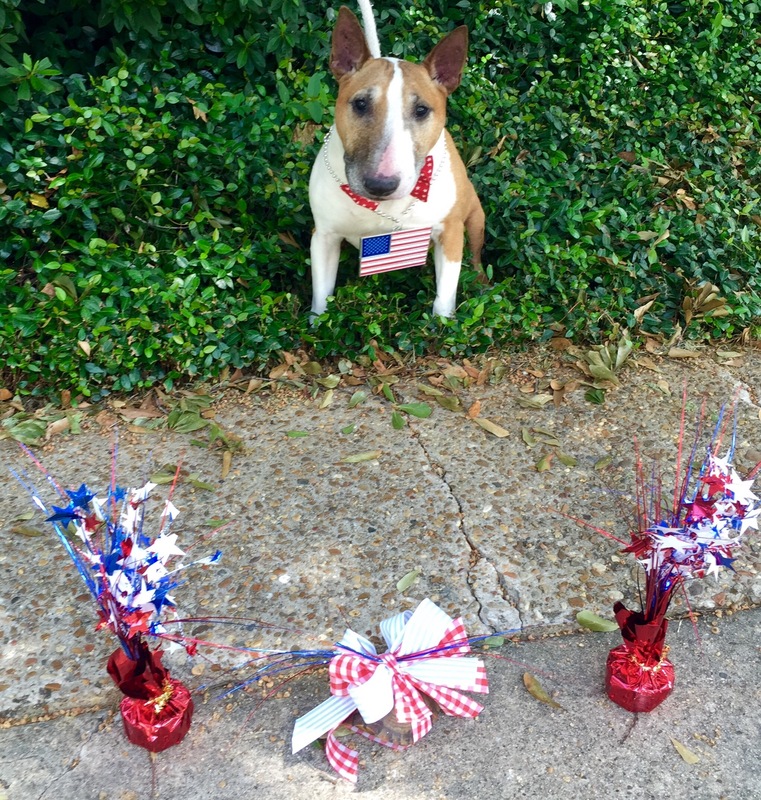 Of course she immediately took him inside to be indelibly marked as number 50, complete with a little touch of the RED, WHITE and BLUE and a big old gaudy bow to begin our FALDERAL celebration. 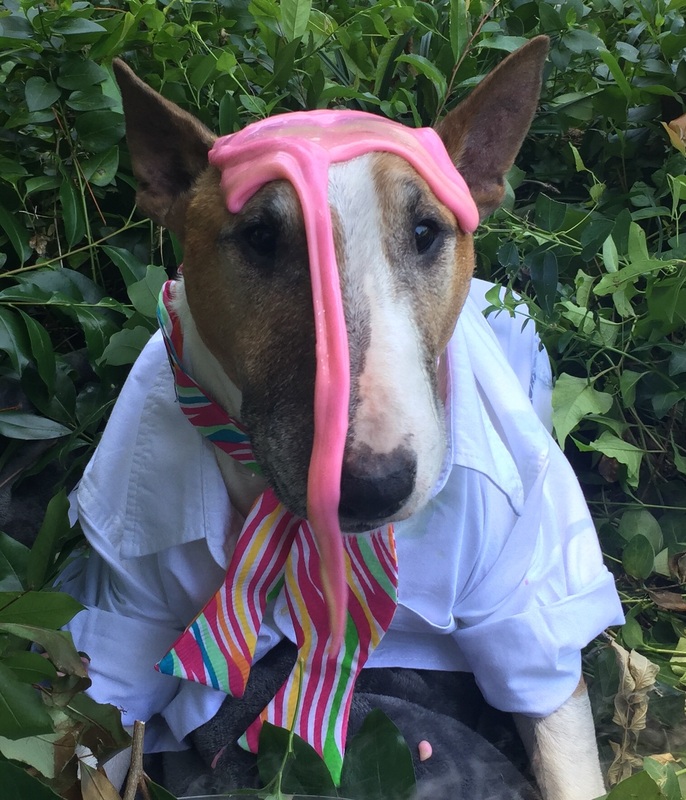 We posed for pics, partied, I got lots of treats and then it happened- I was told it was time for #50 to be released. I stomped my feet a bit, but then I just pranced around. After all, today was a momentous occasion! 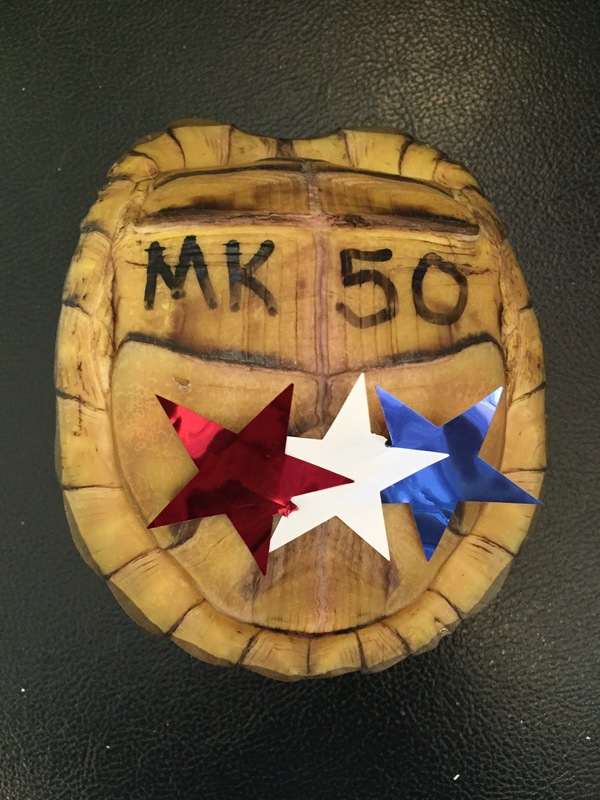 Number 50 has now gone into the record books and I am, most unabashedly, the Turtle King of Walker House!